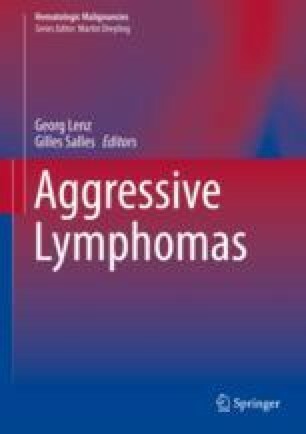 Diffuse large B-cell lymphomas (DLBCLs) comprise a diverse group of aggressive lymphoid tumors characterized by distinct genetic, phenotypic, and clinical features, with over ten entities recognized in the updated WHO classification of hematopoietic and lymphoid tissues. Among them, DLBCL not otherwise specified (NOS) represents the most common diagnosis, accounting for 25–30% of all B cell lymphoma cases. In recent years, significant progress has been made in our understanding of the molecular pathogenesis of these diseases, thanks to the development of powerful genomic technologies that enabled the definition of multiple phenotypic and molecular subtypes of the disease, often associated with discrete clinical outcomes. These studies revealed a multitude of genetic alterations that contribute to the malignant transformation process by disrupting functional programs critical for the biology of normal germinal center B cells, i.e., the normal counterpart of most DLBCL types. These include epigenetic remodeling, blockade of B-cell differentiation, escape from immune surveillance, and the dysregulated expression of several transcription factors/signal transduction pathways. This wealth of new information is offering unique opportunities for the development of improved diagnostic and prognostic tools that could assist in the clinical management of DLBCL patients. Importantly, a number of the identified mutated genes are potentially actionable targets that are currently being explored for the development of novel therapeutic strategies. In this chapter, we summarize current knowledge on the pathology, biology, and genetic basis of these diseases, with emphasis on its most common types. The authors wish to thank Drs. Annette Staiger and Heike Horn for helpful discussions and editorial help and Dr. Marco Fangazio for help with Figs. 2.5 and 2.6.